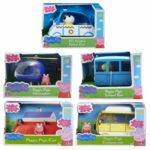 Make up your own Peppa Pig stories with the Peppa Pig Family pack. 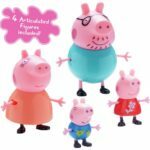 Includes 4 articulated figures: Mummy Pig, Daddy Pig, Peppa Pig & George Pig. Styles may vary. Push Peppa around her in these fantastic free-wheeling vehicles.